Indiana governor Mike Pence (seated) at a private ceremony to sign a religious freedom bill into law, Thursday, March 26, 2015. Things have hit the fan in the wake of the signing of the Indiana Religious Freedom Restoration Act (RFRA) by GOP Gov. Mike Pence. Pence and other defenders of the bill argued that it was the same as the other state RFRAs, as well as the federal RFRA signed by President Bill Clinton. Discrimination was not intended, so what was everyone so upset about? The claim that the bill did not intend to protect discrimination collapsed as civil rights activists (such as the Indiana ACLU) quickly proved that discrimination was exactly the intent. It is revealing how important it was to conservatives that the bill not be seen as discriminatory – using false claims about the federal and other state level RFRAs as a cover. But also revealing is their attempt to reinterpret the intentions of the authors of the federal and other state RFRAs. This is of a piece with the long-term Christian Right campaign to redefine religious liberty in the country in terms favorable to their theocratic vision. Conservative Republican politicians, their apologists (like The New York Times columnist David Brooks), and allied groups suggested that the bills are essentially the same. The Times’ own reporting cited legal scholars, including Columbia Law School professor Katherine Franke, who said that the Indiana is not the same as the federal law or the Illinois state law supported by President Obama when he served in the Illinois State Senate. 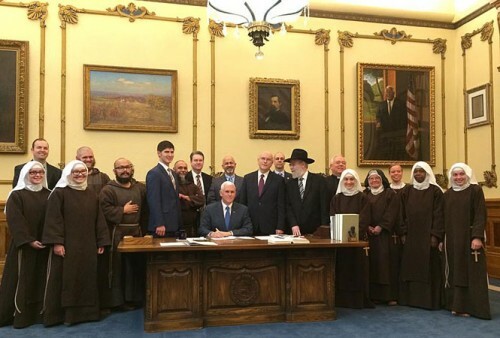 “[Franke] and other legal experts said the Indiana law expands the parties who could ask for relief on religious grounds to include a wider range of corporations, if individuals with ‘substantial control’ of the business share the same religious beliefs.